Publishing Approval Minister's deputy office in press and publicity affairs of ministry of culture and Islamic guidance according to certificate number as international quarterly medical journal. Aim & Scope Journal of Orthopedic and Spine Trauma is a peer-reviewed medical publication. 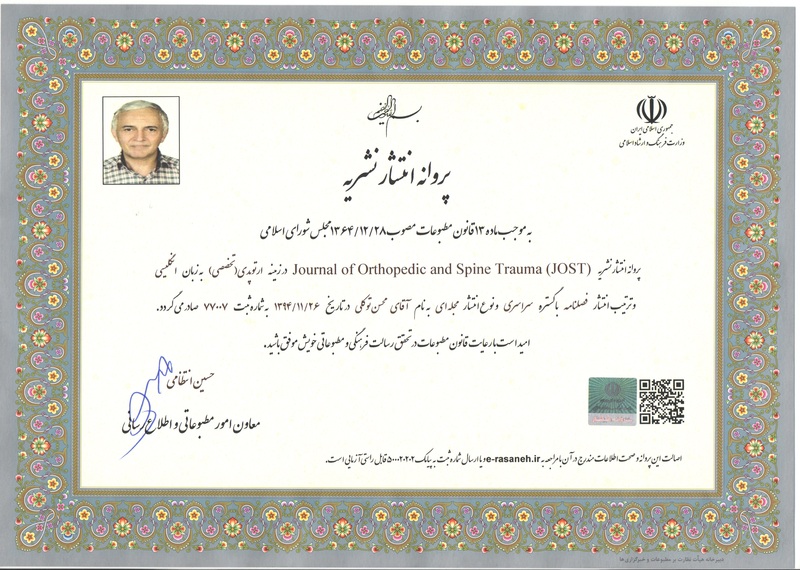 The purpose of Iran JOST is to increase knowledge, stimulate research in all fields of orthopedics, and promote better management of spine patients. To achieve the goals, the journal of publishes basic, biomedical, and clinical investigations on prevalent diseases relevant to orthopedics. The acceptance criteria for all papers are the quality and originality of the research and their significance to our readership. Except where otherwise stated, manuscripts are peer-reviewed by the minimum of three anonymous reviewers. The Editorial Board reserves the right to refuse any material for publication and advises that authors should retain copies of submitted manuscripts and correspondence as the material may not be returned. Final acceptance or rejection rests with the Editors.